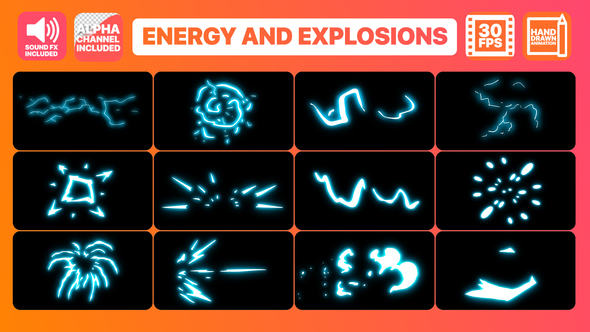 Energy And Explosion Elements Pack contains hand-drawn cartoon electric, energy and explosion elements. Easy to use. Just drop elements to your project. Easy to customize. Smart color controller and glow effect switch will save your time. 100% vector, so you can upscale the elements without losing quality. Sound FX included. A great way to improve the look of your projects, commercials, music clips, events, video games, broadcast, mouvies, TV show and more. Combine elements and make excellent text and logo animation.